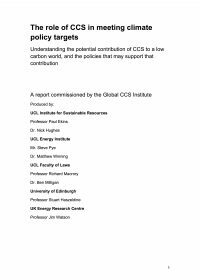 This report presents the results of the case study conducted to make explicit the history and lessons learnt of the Rotterdam CCS Cluster Project. a local (political) commitment to a long-term approach towards CCS deployment which transcends the region of Rotterdam. The Rotterdam CCS Network project has experiences in a large number of fields that are considered highly relevant to other CCS projects. For example, use of goals and means, internal organisation, cooperation with industry, authorities and other stakeholders, technical, financial, legal and communication aspects, and lobbying. This slide report presents the interim results of the case study conducted to make explicit the history and lessons learnt of the Rotterdam CCS Network Project. The Rotterdam CCS Network project has experiences in a large number of fields that are considered highly relevant to other CCS projects: i.e. use of goals and means; internal organisation; cooperation with industry, authorities and other stakeholders; technical, financial, legal and communication aspects; and lobbying. Together the RCI and the Institute phrased the following two objectives for a case study: discover the lessons learnt from Rotterdam useful for the support of CCS projects around the globe; and improvement of the Rotterdam CCS project itself. In early 2010, TNO Built Environment and Geosciences (TNO) was contracted by the Rotterdam Climate Initiative (RCI) to conduct an Independent CO2 Storage Assessment (“the ISA” or “the Study”) of offshore CO2 storage sites under the Dutch North Sea, so as to support the early deployment of carbon capture and storage (CCS) in Rotterdam and the development of a Rotterdam CCS Network. This document provides an outline of the rationale and key objectives for the Study and a description of the methodology applied. Conference report fro the 1st carbon capture and storage seminar for the regions, Rotterdam, July 2010.